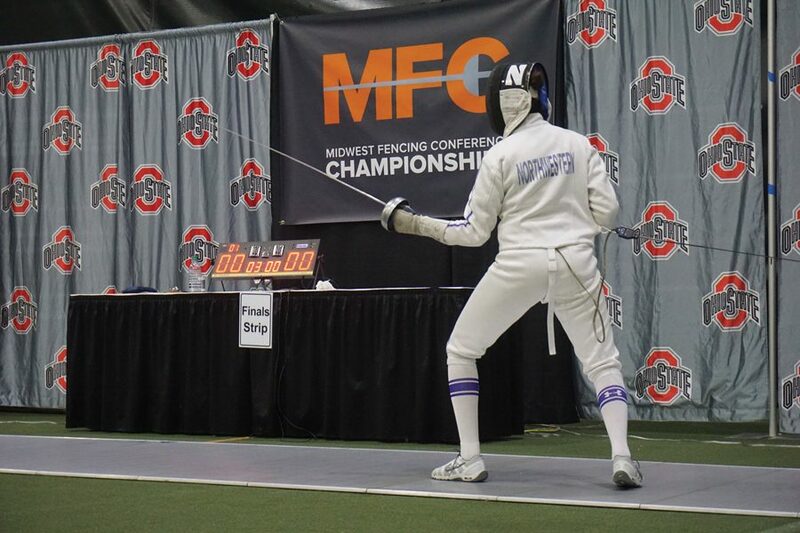 A Northwestern fencer readies herself on the strip. The Wildcats turned in a solid performance at the January North American Cup last weekend. After almost one month between events, Northwestern returned to the strip at the January North American Cup event in Virginia Beach last weekend. However, the Wildcats’ return to action was delayed due to weather and travel problems in the lead-up to and first day of the tournament. A day before the NAC began, NU’s flight to Philadelphia on Thursday was cancelled due to winter storms in the Northeast, forcing them to fly early the next morning. After leaving Patten Gymnasium at 2:30 a.m. Friday and taking a 5 a.m. flight, the team arrived in the City of Brotherly Love. But the travel woes weren’t over for the Wildcats. First, the Cats’ connecting flight to Norfolk, Virginia was cancelled. Then, it took eight hours for the team to receive their bags. When the bags were finally secured, some fencers’ bags were missing. And since they were not guaranteed a flight to Norfolk until Sunday, NU embarked on a long bus ride to Virginia Beach. All in all, it was a 19-hour travel day that Moss said was unlike anything he had ever experienced. Despite the obstacles the team faced in getting to Virginia, the Cats managed to enjoy some success when they finally arrived. The best finish of the weekend came when the quartet of freshmen Alexis Browne, Jacqueline Hua and Isabella Min and senior Emine Yücel won the team sabre event. “They fenced some challenging teams that could have pushed them, and they handled it really well,” Moss said. In the eight-team, single elimination tournament, NU defeated Cornell in the quarterfinals, Sheridan Fencing Academy in the semifinals and Boston Fencing Club in the finals. The Cats’ best performance was in the semifinal bout, where Yücel turned a 35-27 deficit into a 40-39 lead and Browne followed up by securing the victory in the next round. Moss said that on the individual level, two fencers stood out with their impressive performances — Jia and junior epee Ella Lombard. Lombard finished 50th out of 180 fencers in the Division I epee event, going 8-6 over two days of competition. Jia was the highest-placing individual finisher for NU. She finished 21st in the 159-person junior foil event, going 5-1 in pool play and 2-1 in direct elimination bouts. Lombard said Jia’s performance on the strip inspired her during her matches with her optimistic mindset. Jia and Lombard were not the only Cats who fenced well. Freshman foil Sarah Filby finished in 39th place in the junior foil and 65th place in the Division I foil event. Sophomore epee Pauline Hamilton finished in 42nd place in the Division I epee event, despite having to compete in brand new equipment after her bags never made it to Philadelphia. Before contributing to the team sabre victory, Browne finished 6-0 in junior sabre pool play. Looking back on everything that happened over the past few days, Lombard said she was happy the team stayed together and did not let travel obstacles ruin the weekend.